Yet another update in our ongoing group test of chilli-flavoured crisps. This time it's the turn of Mackie's of Scotland and their scotch bonnet chilli pepper flavour (currently available in your local Lidl). These crisps are a little old-fashioned in texture: they are quite thick and hard, rather like the way KP and Murphy's crisps used to be back in the 80s. Not immediately appealing. 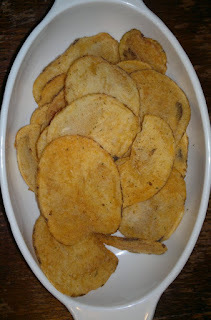 They are also quite dark in appearance as they are "well done"; the seasoning also makes them look quite dark, and there are red and green flecks. 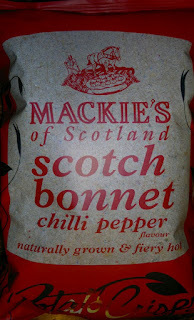 The flavour is quite pleasant, heavy on the sweet chilli/capsicum, with a dollop of tomato and herbs. Reminiscent, if anything, of chilli ketchup. However, the dark fry also pushes through – not exactly burnt, but it makes its presence felt in the flavour. In terms of heat, they don't really live up to the "fiery hot" billing on the packet. There is a slow build of heat on the tongue and in the throat, but only to about 2 or so (2.5 if we're generous) on the insertcrisps.com heat scale. Overall, fairly pleasant but not one of our favourites.